It’s worth noting, in the age of digital music delivery, that the YouTube evidence backs him up. There are pages and pages of “Wagon Wheel” covers, from a live radio version by U.K. stars Mumford & Sons, to performances by a busking Canadian accordionist, a one-kid-band in a high school talent show and hordes of young bedroom and barroom troubadours. (You can even find a video of Luke Bryan – the guy behind the vile 2011 hit “Country Girl (Shake It For Me)” – struggling through the verses on stage.) 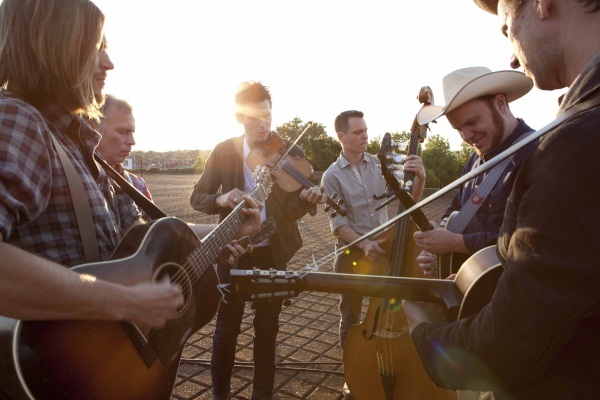 Not only was this single from Old Crow’s self-titled 2004 album certified gold – for the below forty-set especially, it’s become a bona fide folk standard, eminently singable and shareable. The way that Ketch Secor – Old Crow’s singing, songwriting, fiddle-playing, harp-blowing de facto leader – came to share credit with Bob Dylan for writing “Wagon Wheel” says a lot. It wasn’t like they sat down together one day and cranked out the easy-rocking country tune. In reality, a teenaged Secor discovered the “Rock Me Mama” chorus on an obscure Dylan bootleg and took it upon himself to add verses. By then, he’d developed the habit of writing what he calls “stolen melody songs” – like when he penned fresh, war tax-themed lyrics to a tune that had already passed through other wholesale re-writes during its descent from old-time Scots-Irish balladry. “That’s what I saw happening, so I just added my two cents,” Secor explains. Bear in mind that Secor and Fuqua – who’ve been buddies and collaborators since their junior high days in Harrisonburg, Virginia – were inhabiting a very different musical world than the earnest, tradition-emulating one of Ochs’s 1960s folk revival. By the early ‘90s, the atmosphere was one of adolescent angst and alienation from elders. Grunge rockers turned their wrenching emotions inside out for all the world to feel via abstract lyrics and distorted guitar riffs – the important part was they were playing their own songs, and thereby engaging in unvarnished self-expression. And here were Secor and Fuqua learning to play antiquated unamplified instruments and borrowing songs from their fathers,’ grandfathers’ and even great-grandfathers’ generations. At first, it was just the two of them egging each other on in their folky pursuits, but eventually, after a move to Ithaca, New York, they found enough likeminded twenty-somethings to form the band, a much taller order then than it would be now. When Old Crow busked on the streets, made DIY recordings and settled in Boone, North Carolina, the band members weren’t performing songs they’d written, but drawing on a storehouse of pre-war jug band, string band, minstrel show, blues and folk fare.